Ms. Neeru Anand, Director Human Resource at Acreaty received “top HR Leader in North India” Award. - Acreaty Management Consultant (P) Ltd.
Ms. Neeru Anand, Director Human Resource at Acreaty received “top HR Leader in North India” Award. Event partnered by ABP news and YES bank at Taj Mahal Hotel, New Delhi have announced the winners of the “Top HR leaders in India”. 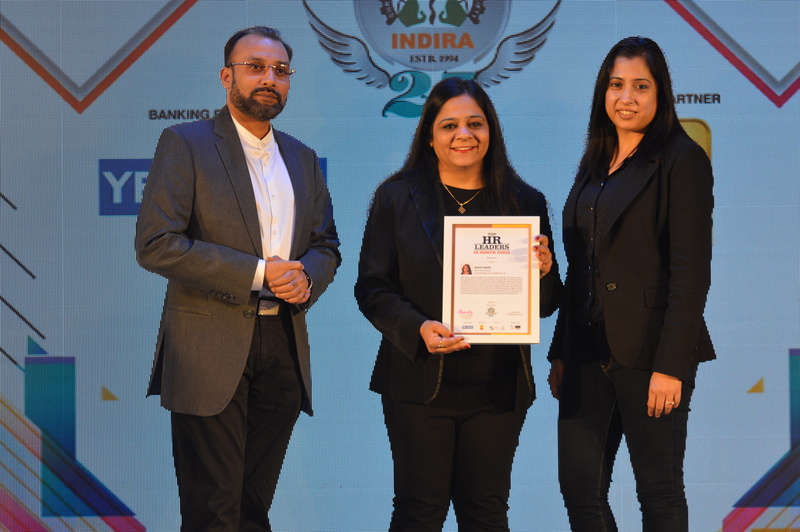 The esteemed Top HR Leader Awards were introduced to acknowledge and reward the extraordinary work and the outcomes gained by the Indian leaders of the corporate world. Ms. Neeru Anand Human resource director of Acreaty Group has received the prestigious award of “top HR leader in North India”. Since 2001, Mrs. Anand has more than 15 years of experience in the field of Human Resources across different industries. She is a management professional and with the experience in Strategic HR Advisory, she consulted on the statutory and advisory boards of both Indian and multinational corporations. She has also served as global Recruitment & Business Head at Acreaty USA and Acreaty South Africa. In her overall career she has effectively strategized and handled different business verticals horizons like top Executive Placements, Web-enabled services, Digital Marketing Campaigns and Outsourcing of national and international organizations. She is the best-known humanist, entrepreneur, an enthusiast of culture and the arts, an educationalist, but her most prominent and eminent role has been that of Chairman of the Acreaty Group. Continuing with the search across India, Top HR leader Awards seek out the leading Scope of the Recruitment industry, looking for those people whose creativity, assurance, experience and strong leadership skills has helped them achieve extra ordinary success in the challenging corporate climate. These awards recognize and honor the most respected companies along with their senior management executives within a variety of industry domains.